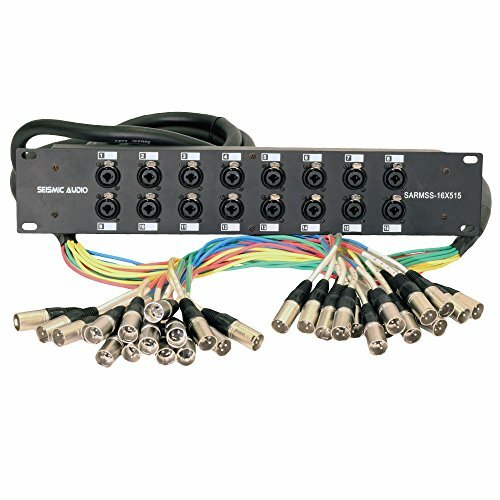 Rack Mount 16 Channel XLR TRS Combo Splitter Snake Cable - 5' and 15' XLR trunks - Model #: SARMSS-16x515, 2 Space Rack Mountable 16 Channel Splitter Snake Cable, XLR / TRS 1/4" Combo Jacks on the box end, High quality XLR connectors at fantail ends, Length: One 5' Cable Trunk & One 15' Cable Trunk, Send Cable - No Returns, Weight: 12.5 lbs, Condition: NEW, Fantail and stage box are both clearly labeled for quick and easy set up, 100% individually shielded pairs, 22 gauge heavy duty conductors, Rack Mountable Heavy duty steel stage box, High quality XLR connectors at fantail ends, High quality XLR / TRS 1/4" Combo Jacks at the box end, Simple hardwired Y splits | Stage box with two hardwired short trunks with fantails, One Year Warranty. With this snake cable, each pair of heavy duty conductors is individually shielded, yielding crystal clear sound while rejecting extraneous noise. XLR connectors make this snake cable fit right in with professional power amps and mixing consoles without the need for converters or couplers. These snakes are your basic hardwired Y splitters. They each have a stage box and two hardwired short trunks with fantails. These splitter snake cables do not have splitter transformers, ground-lift switches, or multi-pin disconnects. These splitter cables are straight send snakes and do not have any returns. The cable ends on the fantails are all male XLR, while the stage box consists of all female XLR and 1/4" combo jacks. You can plug an XLR or a 1/4" in to the box end of the snake. Each stage box is well labeled and constructed from heavy duty steel. The Stage Box is rack mountable for convenience and ease of transport. Both fantails are well labeled and grouped by color.